One major cause of itchy skin in menopausal women is dropping estrogen levels. Estrogen helps control collagen production in the body. 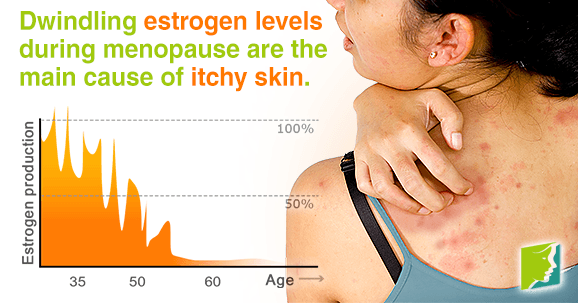 When estrogen levels drop, it can cause skin to become dry and itchy. There are other factors that can cause dry and itchy skin, such as dehydration and stress. Menopausal women can experience itchy skin all over the body, but hands, knees, and elbows are most likely to dry out. Estrogen stimulates the production of natural skin-moisturizing oils and collagen, which improve elasticity. When estrogen levels decline during menopause, the body produces fewer natural oils that moisturize skin, and also reduces the body's ability to retain moisture. Long, hot showers may feel good, but they are very harsh and can significantly dry out skin. High stress levels release a chemical called histamine, which causes itching, flushing, and sometimes rashes. It is important to try and reduce stress as much as possible to avoid menopausal symptoms. Yoga and meditation are helpful ways to reduce stress. This may seem like an obvious cause, but many women do not consider this as a factor regarding itchy skin. It is important to stay hydrated at any age, but it is especially crucial when going through menopause in order to keep your body functioning properly and to promote skin health. This is the “crawling sensation” on the skin that is experienced by some menopausal women. Another similar sensation often experienced is the “pins and needles” feeling. Coconut oil and other natural moisturizers hydrate skin and combat itchiness. Generously apply moisturizer to the body after showering. Wearing cotton clothing to bed helps retain moisture and keep your skin healthy. Staying hydrated not only helps keep the body healthy and functioning properly, but it also helps keep skin moisturized. It is especially important to stay hydrated if your schedule changes or you go on vacation, because it is easy forget to drink water during these times. Fatty acids like omega-3 promote skin and hair health. Salmon, walnuts, and eggs, and seeds are all rich in beneficial fatty acids. Above all else, protecting the skin is the best prevention method of itchiness and dryness. Dermatologists generally recommend wearing sunscreen every day (even when it is not sunny) of SPF 15 or higher to protect the skin. Itchy skin can be an irritating and frustrating symptom of menopause. It is important moisturize and protect your skin as much as possible in order to prevent dryness and itchiness. Dwindling estrogen levels during menopause can cause of dry, itchy skin, but by following treatments can heal itchy and dry skin.